Energy healing techniques are as varied as the energy healers who do them. You can heal with your hands, your eyes, your voice, your energy field, your full body, your intention. In this page, however, I'll focus on teaching you some basic methods that use your hands to heal. Although you'll want to study and practice to become proficient, this page will get you started. With these energy healing techniques, you should feel comfortable starting to work with simple healing and wellness issues for yourself and close family and friends. However, you should not practice outside your immediate circle (and certainly not professionally). Go into a healing with your energy/vibration at the highest level possible. Here are some ideas for energy healer preparation. No matter what form healing takes, intention is at its base. Our intention is unbelievably powerful, and much more important than any specific energy healing techniques we use. Setting an intention to heal, to support the client's (whether it's you or another person) highest good, to remain non-attached to outcome--this is the foundation of all other healing work. Always start with these intentions, and also ask the client what her or his specific intentions for the healing are. S/he does not necessarily have to share them with you, but should have them in mind. Learn more about using intention in an energy healing setting here. As an energy healer, the power of suggestion is a potent tool that you need to use consciously and positively. Learn about how to use the power of positive suggestion as a positive force for healing here. Scanning is an energy healing technique that involves passing the hands over the energy field, a few inches to a few feet away from the physical body, to pick up information and assess the field. With open palms turned toward the client's body, move your hands along the front of the body, starting about 4-5 inches away. Generally move from the feet to the head. Stay relaxed and be open and aware to sensations in your hands. You might feel buzzing, hot, cold, bumps, dips, pushing, pulling, or many other sensations. You may get intuitive information, or you may just feel drawn to particular chakras or areas of the body. Just notice--no need to interpret or "diagnose." One of the most basic of all energy healing techniques is to use the still placement of your hands to clear and modulate imbalanced, "stuck," or disharmonious energy. With your hands on the physical body or in the field, you simply hold your hands still or move them very slightly over an area where the energy feels disturbed. Your intention here should be to return the energy to balance, flow, and coherence. At some point, the energy will feel smooth or harmonious again, or you will get the sense that it's time to move on. If it does not resolve in a reasonable length of time, it may be that the disharmony is a necessary part of a larger process of healing. In that case, release it to a higher wisdom and move on. This is a very natural process. For example, everyone has hurt themselves and automatically placed their hand on or held the hurt place. That's an instinctive form of modulation. Reiki is another form of energy healing that relies a lot on modulation or use of "still hands." This basic energy healing technique uses the hands in motion to smooth and clear the field when it feels disturbed, ruffled, buzzy, rough, blocked, in turmoil, or otherwise disharmonious and imbalanced. It helps return the energy to its natural state of movement, flow, and harmony. To do this, simply move your open palms repeatedly in a sweeping, smoothing motion through the field, approximately 6 inches to several feet above the body. Generally speaking, move your hands from above the area you are working on, to well beyond it. A sequence that often works well is to sweep the whole field for a while, then to turn your attention to particular places that seem to need extra support (such as an area of pain or injury or a place where the energy feels disturbed), and then to end by sweeping the entire field again for a while. You can often feel the energy smooth out as you work with it. When excess energy has collected in an area of the body or field, the hands can be used to "pump" or "drain" the energy off, helping to rebalance the area. This energy healing method can be particularly useful for headaches, wounds, and other types of pain. Place your right hand (if you are right-handed) in the field above the area of pain or excess energy. Hold your left hand out and away from you, pointed toward the ground. Hold the intention to pull the excess energy into your right hand and send it out into the earth through your left hand. You may be able to feel the flow of energy. If you feel the flow of energy slow down before the client's pain has diminished significantly, you can gently "pump" your left hand, making a gentle fist and opening it back up again several times in fast succession. An energy healing technique to pull unwanted energy out of the field (e.g. the energy of another person, of a drug, of an illness, of a traumatic experience, etc. ), is to use your hands like magnets. With your hands in the field above the area that seems to need this treatment, set the intention to pull the unwanted energy out of the body and/or the field. Visualize or feel it being pulled out the client's body/field and "sticking" to your hands. Every so often, flick your hands toward the earth to get rid of the energy. If you want to treat the whole body/field, repeatedly pass your hands through the field along the whole body, in most cases moving from above the head to beyond the feet. Imagine the unwanted energy sticking to your hands. Use your hands in a rake-like fashion (with your fingers or energy-fingers acting as the tines of the rake). Every so often, flick your hands toward the earth to dispel the energy collected on your hands. Often you will feel the client's energy become very smooth. This is very similar to smoothing the field, but with a slightly different intent. This extremely simple, soothing energy technique can be used for a wide variety of things. If I could only choose one technique, this would be in my short list. We can do energy work in many ways. Did you know you can use your breath? Here you'll find 5 ways to use breathwork as an energy healing method for clients, plus 9 ways to us it for yourself. Feet are important energetically. Here you'll find energy healing techniques you can use with the feet. Get outdoors and take a brisk walk. Imagine your essence as a small, beautiful light, flame, or jewel inside your body/field. Locate it somewhere in particular (e.g. your heart, your abdomen, your head…). Visualize it growing and expanding, first to fill your body, then to fill your field. As it expands, visualize or know that it pushes out of your body/field anything that is not of you. Taking care of your own energy, including your chakras is critical for anyone doing energywork. 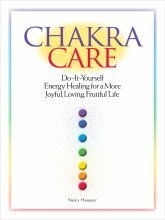 I wrote my book Chakra Care: Do-It-Yourself Energy Healing for a More Joyful, Loving, Fruitful Life, to encourage people to do this. In it, I've given over 500 down-to-earth activities and exercises you can use to balance, nurture and heal your own chakras. Of course, if you can find a teacher to help you learn these and other basic energy healing techniques, that's ideal. But if you can't find a local teacher to help you learn energy healing, the techniques above, plus the other pages in this section on energy healing basics (link below) should be enough to get you started. For more advanced energy medicine techniques, you should definitely have an experienced teacher with a developed light-body. I also strongly encourage you to RECEIVE energywork directly (not at a distance) if at all possible, and also to find a way to watch an experienced energy healer at work. Both of these were extremely helpful to me when I was new at this. Remember to stay relaxed and amused. Hold a high intention, but don't feel the need to know or interpret anything. Just do the work and know that good will come of it, even if you can't know the exact form that good will take. Also, be aware that if something that feels like an energetic disharmony will not resolve in a reasonable length of time, it may be that the disharmony is a necessary part of a larger process of healing. In that case, just set an intention to support the healing process, without feeling the need to "fix" it. Being humble and having a perennial "beginner's mind" is a big part of doing this work, as important as any specific energy healing technique that you might use. Go from Energy Healing Techniques to Energy Healing Basics page.